This animal was feeding very actively on the blooms of an oregano bush and also could be found on dill blooms as well. It was doing its best to look like a wasp. When captured it would attempt to "sting" you or at least make the motions of doing so. Adults frequent visitors of horsemint (Monarda punctata) in central and eastern Texas (Hovore et al. 1986). Taber & Fleenor (2003) report this species common on Coreopsis during May and June near Bastrop, Texas. Similar Species: There are 10 species of Strangalia (and one subspecies) north of Mexico, four occur in Texas. Arnett, R.H., Jr., M.C. Thomas, P. E. Skelley & J.H. Frank. (editors). 2002. American Beetles, Volume II: Polyphaga: Scarabaeoidea through Curculionoidea. CRC Press. 861 pp. Linsley, E.G. 1962. 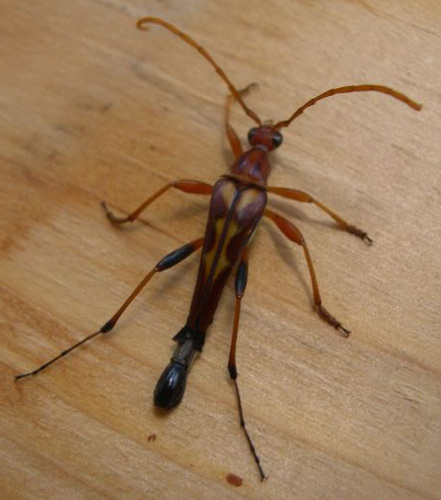 The Cerambycidae of North America. Part III. Taxonomy and classification of the subfamily Cerambycinae, tribes Opsimini through Megaderini. Univ. Calif. Publs Ent, Berkeley, 20: 1-188, 56 figs. Linsley E.G. & J.A. Chemsak. 1972. Cerambycidae of North America. Part VI. No. 2: Taxonomy and classification of the subfamily Lepturinae. University of California Publications in Entomology 80: 1-186.